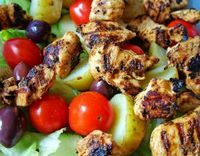 This simple Mediterranean Chicken Salad Recipe is easy to put together and a great meal idea for leftover chicken. In the Mediterranean you are standing at a cross roads of cultures, colours and civilizations. This landscape has given us fascinating history and a thousand postcard images. It remains incredibly vibrant and impossible to capture, it can only be experienced. Exploring olive groves and ancient cities, beaches, mountains and breathtaking scenery is impossible on an empty stomach. The Mediterranean has beautiful cuisine on offer. But you don't have to visit the Greek Islands to experience the food. You can make it in you own kitchen. The recipes are bursting with flavour and use a lot of fresh ingredients. Loads of herbs, lemon juice, olive oil and garlic help you savour the fresh and inviting tastes of the Med. You can jazz up this chicken salad with some squares of feta cheese or serve it with low-fat chunky cottage cheese for a healthier alternative. 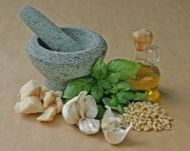 Mediterranean cooking generally makes use of olive oil and garlic and is considered a healthy way of eating - hence the Mediterranean Diet. Mix together the olive oil, lemon juice, garlic, salt and pepper in a small bowl. Place the salad ingredients except the chicken in a large bowl. Pour the dressing over the salad and toss the chicken in gently to combine just before serving. This chicken salad serves beautifully with Ciabatta toast. A fruity rose is a lovely lunch-time wine if you want to pair this meal with a wine.